I would just like to wish all my followers a very Happy Christmas and thank you for all your wonderful support and fabby comments this year too. The lovely Debby is holding her annual favourite Christmas Cards and i thought it was going to be easy this year, but i could easily have picked another 3 or 4 !!! I love this image, it was one that i won, a while ago in a candyand i also got Top 5 in an Allsorts Challenge for it too. The photo doesn't do the card justice, as the papers are embossed with glitter too and i gave this card to H's best friends family. I love the fabby papers i've used 'Doodlebug' and i love it when 2 images can tell a story too. This card also brings back fabby memories, as i won my first ever Penny Black Saturday Challenge prize with it, thanks ladies. And finally another image i don't have, but had lots of fun with and is also on my wish list for the New Year - although looking back now i wish i had glamour dusted the image as well, i also won the Oldie But A Goodie Challenge. Hope you and yours had a wonderful Christmas and here's to a Happy Healthy New Year. Great selection of Christmas cards! Love your choice of colours, very original!! I need to find out where I can get this glamour dust!!! Thanks for the inspiration! Happy Holidays to you and yours! Your top 5 are all gorgeous Sam. Oh what a wonderful selection of Christmas Cards Sam, no way can I choose a favourite cos each one is so gorgeous. Thank you for joining My Favourite Christmas Cards. Lovely set of cards Sam, I think the first one is my favourite. 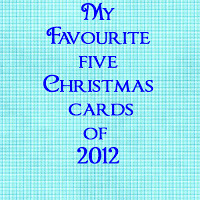 Have a great 2013 & thank you for my cards.